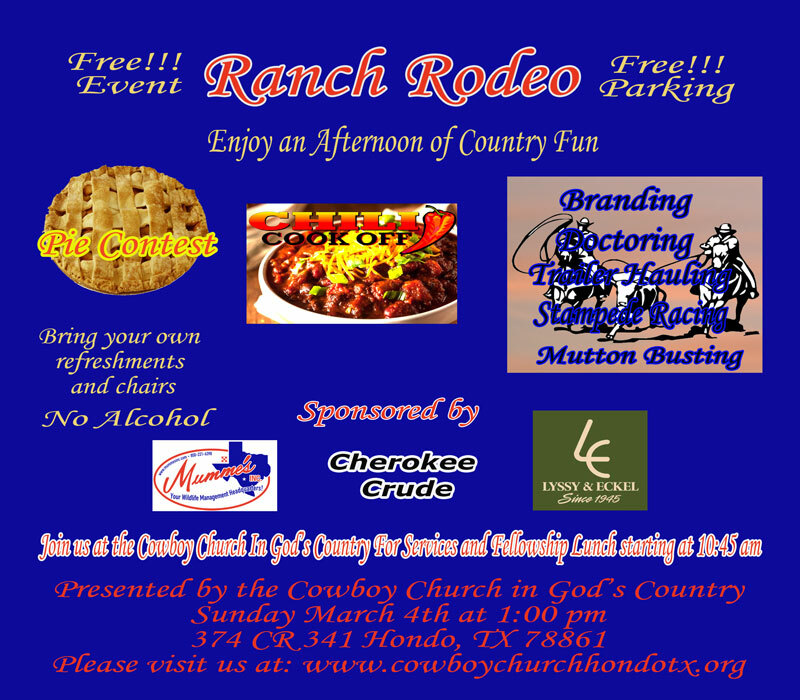 Come Celebrate with the Cowboy Church In God's Country 10 year celebration!!! Bring your Family and Friends for a wonderful packed weekend of celebrating with our Cowboy Church Family! If you have ever visited and have gone to CCGC, please, we invite you to come celebrate with us March 3rd and 4th 2018! Festivities start on Saturday evening with a Free Branded Concert! 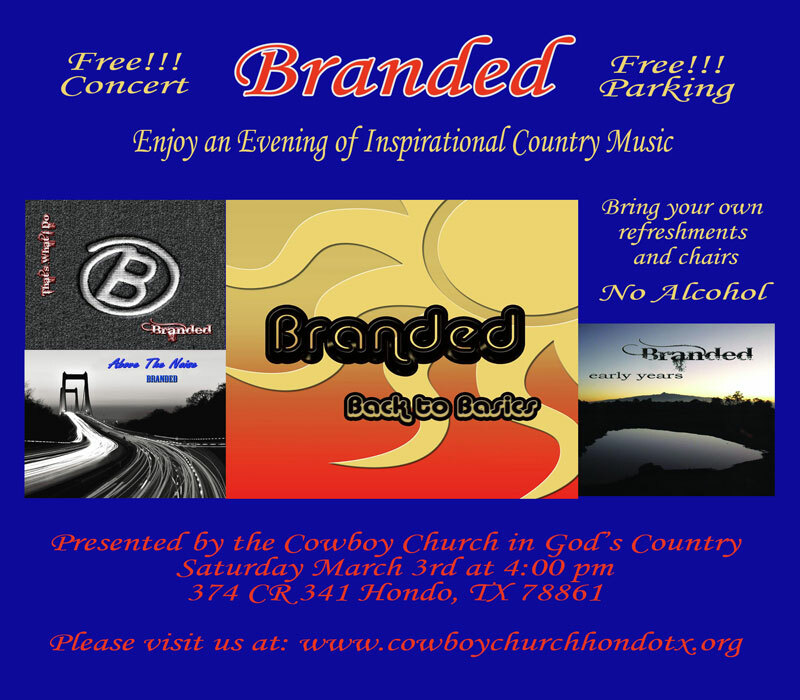 Come bring a blanket, yard chairs or sit on the bales of hay and enjoy a FREE concert by Branded, an award winning Christian Duo of Christian music that will have your toes tapping and maybe even get up to dance! We pick up on Sunday morning (11am) with our Celebration Worship Service (with all those that have ever been on the worship team! And Branded!) then Pastor Ross's message! Immediately after service we will have a professional Ranch Rodeo!!!! Beautiful Cowboy Church In God’s Country Buckles will be awarded to the best team along with cash prizes!!!! $600 Team Entry fee. There is also Mutton Bustin' for the kids! (50 lbs and under please) with trophys to all contestants until we run out! Celebrating alongside of the Ranch Rodeo we will have a Chili (meat only, 3 lb minimum!) Cook Off and a Pie Bake Off (no pie categories! Just the best pie you can make!!!)!!!! So Bring your best Chili and Pies and have them entered and in before 11am! $20 entry for the Chili Cook Off and $10 entry for the Pie Bake Off. A Beautiful Cowboy Church In God’s Country Buckle as well as cash prizes will be awarded to the best Chili and one for the Best Pie! Friday February 23rd 2018 7-9pm and continues Saturday the 24th 9am- 5pm. We will be using Pastor Pete Pawelek's (from the Cowboy Fellowship, Jourdanton, TX) Dare To Lead, 2nd edition. Learn what it takes to be a leader, especially in the church or ministry setting. We will topically cover the book and will have a weekly write-in, on-line discussion to further strengthen the leadership qualities that God has given you. We will offer a lifetime fellowship to foster "Iron sharpening Iron" to guide you through the ever changing "minefield"! December 17 starting @ 5pm- 7:30pm! Bring your family to celebrate the Birth of our Savior! We are an AF2C affiliated Cowboy Church! We have added a DONATE button for your convenience. If you do not have a PayPal account, please follow the instructions on the left hand side of the PayPal page. Make sure to designate where the gift is to be placed: Building Fund or General Fund in the note section! If you do not, it will be assumed that you would like it placed in the Building Fund. You can also do a "reoccurring" monthly donation for your tithe! Check "ReOccurring" & please make sure to note that in the message block as well! Thank you and may God richly bless you beyond measure and your "cup overflow" for your gift!